Ter Waele Habiba is een prachtig merrieveulen met een fantastische uitstraling en karakter. Haar vader is de bijzondere Elite hengst El Mariachi. In the year 2010 El Mariachi finished his stallion performance test (70 days) in the State Stud Marbach with a total index of 118.59 points (performance category I - Jumping 106.17 and Dressage 114.54 points) and thus demonstrating an excellent third place (of 20) against tough warmblood and anglo-arabian competitors. Father and daughter were again successful: El Mariachi achieved both, Bronze Senior Male Champion on the national C- and international B-Show. His daughter Gina Lollobrigida became class winner and was awarded with the SILVER Junior Female Champion title. El Mariachi led the Top 5 of the senior stallions and became GOLD Male Champion and Best in Show. El Mariachi was awarded with the Bronze Champion Senior Stallion title. El Mariachi was awarded with the Silver Champion Senior Stallion title. El Mariachi became Silver Champion of the senior stallions and his daughter Gina Lollobrigida was able to catch the Champion Foal title (fillies and colts). 2011 Licensed in Prussendorf for German sport horses! El Mariachi finished his stallion performance test (70 days) in the State Stud Marbach with a total index of 118.59 points (performance category I - Jumping 106.17 and Dressage 114.54 points) and thus demonstrating an excellent third place (of 20) against tough warmblood and anglo-arabian competitors. 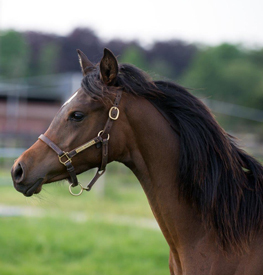 Premium stallion at the licensing for the Arabian horses of the German breeding association VZAP e.V. in Aachen and recognition for all Arabian breeding groups. Here at Ter Waele we've had great results with a prior breeding to El Mariachi's sire Psynergy, who was the sire of the outstanding gelding Ter Waele Hamid who is exported to the United Kingdom. El Mariachi was chosen because I wanted a stallion with an exceptional dam’s bloodline that linked back to Crabbets and the Old English lines and a stallion who is a complete horse and who also can perform under saddle too.